Last week I showed you the new yarn that arrived for a crochet project. I should probably explain to new readers that although I can crochet, it's not something I do very often. There are two main reasons for this - I generally prefer the look of knitted fabric, and I don't "speak" fluent crochet. I put this down to early confusion over UK and US terms and probably a few badly written patterns which I tried to follow when I was learning to crochet. Nowadays, I'm much happier following a crochet chart than a written pattern. 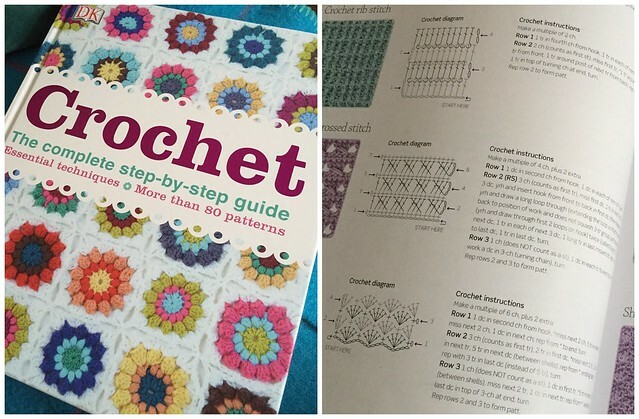 I am especially fond of Dorling Kindersley's "Crochet" book which includes lots of different stitch patterns (with charts) along with various techniques and patterns etc. It's a great go-to and memory-jogger on the rare occasions I decide to pick up a hook. Using the book for stitch inspiration, I decided to make a super simple rectangular wrap which can be worn in various different ways, courtesy of my favourite shawl pin. I've been trying it on as I work, and it's going to be really adaptable (that makes me very happy!). It's also very warm. For those who missed the first post, this delicious yarn is Scheepjes Vinci in colourway 004, available from Deramores (see here for worldwide shipping information). It feels quite woolly (it's 60% wool / 40% acrylic), yet it glides over the wooden hook easier than a 100% wool yarn might be expected to. The colour changes are really good, and I've only had one knot in the three balls I've used so far. I really like working with it. 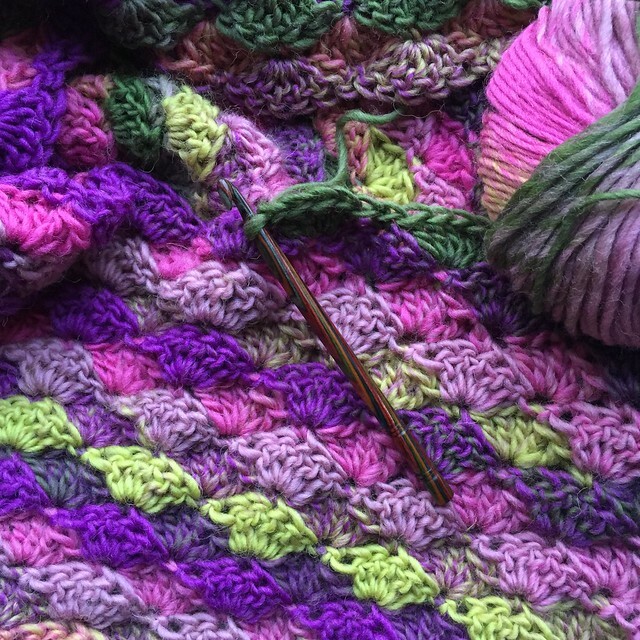 I'm planning to wear the wrap to Unravel next weekend and will post the FO next Friday - I can't wait! Already it looks gorgeous! Can't wait to see it on and finished! Thanks Sam, I can't wait to show you on Friday! Beautiful colorway! It is going to be a gorgeous wrap! Can't wait to see. Thanks - I love it ! These bright colors are you. I like that shell like stitch. Your wooden hook is pretty.